Cut hot dogs and carrots into a medium-size dice. Add oil to a large nonstick skillet or wok over medium-high heat. Add hot dogs and carrots and cook until carrots are softened and hot dogs are starting to brown, about 3 to 4 minutes. Add cooked and cooled rice to the skillet and toss to combine. Add peas and cook for 1 to 2 minutes. Scramble eggs in a small bowl and add to rice along with soy sauce and sesame oil. Stir together to quickly cook egg and combine ingredients. 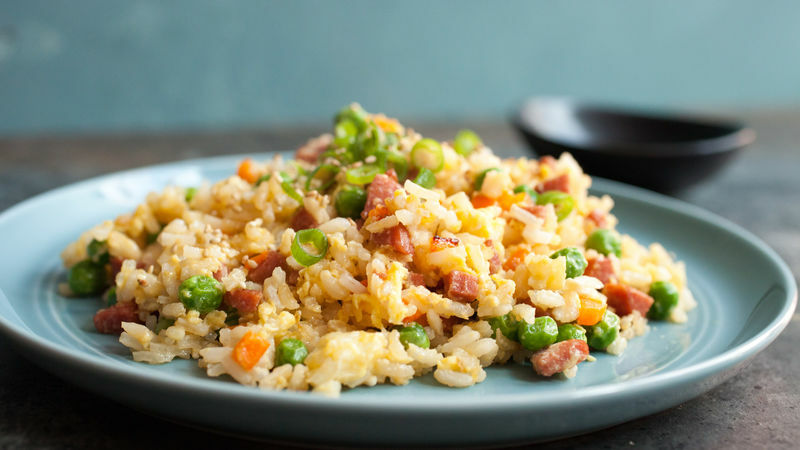 Divide fried rice between two plates and garnish with sesame seeds and scallions.